Vifa Oslo is a minimalist portable Bluetooth speaker | What Hi-Fi? 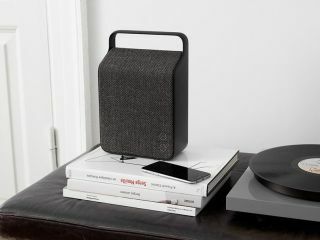 Danish manufacturer Vifa has announced Oslo, the fourth wireless speaker in its repertoire. It’s designed to offer style and substance. Vifa isn’t a brand we’ve heard of before at What Hi-Fi?, but a quick perusal of the company’s website tells us it was formed in a Danish village in 1933. Vifa made driver units for “many well-known high-end brands” until 2014, when it made the transition into making its own wireless speakers. Enter the Oslo, the fourth speaker to be released in the last three years. Vifa has opted to make the Oslo taller than it is wide so as to give it a small footprint, meaning you can be more flexible with its placement. But according to chief design engineer, Mikael Ankersen, it has "the physics for a full-bodied reproduction of music”. The Oslo follows a similar design to Vifa’s other city-inspired speakers: Copenhagen, Stockholm and Helsinki. It features a textile cover from Kvadrat, “Europe’s leading manufacturer of design textiles”, which goes over an aluminium frame. There are five colour finishes on offer: sand yellow, ocean blue, ice blue, anthracite grey and pebble grey. Under the cloth exterior are two 50mm Vifa-designed drivers with aluminium cones and neodymium magnets, plus two 65mm Vifa-designed woofers. These have flat sandwich cones and neodymium magnets, are mounted back-to-back and are coupled to two passive radiators. Connection to the speaker is via aptX Bluetooth but there’s a 3.5mm auxiliary input for a wired connection. The Vifa Oslo is available now for £400.